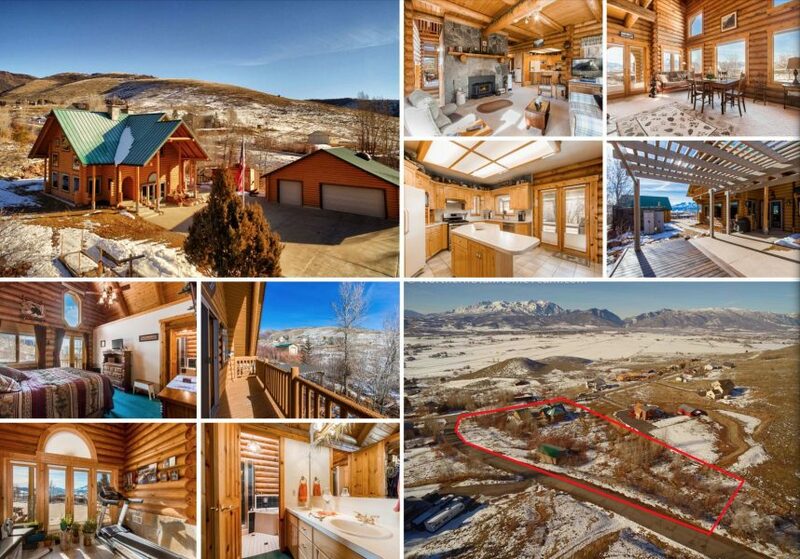 Welcome home to your 4 bed, 3 bath Ogden Valley (Huntsville) Utah log home for sale with killer lake, valley and mountain views and 24′ x 36′ outbuilding. The centerpiece of the home is the captivating 25 foot high rock structure with 2 separate fireplaces. You will also enjoy vaulted ceilings, tile, new blinds, solid wood doors, Anderson wood windows, life-time metal roof, newly painted exterior logs, 2 furnaces (one upstairs and a newer one downstairs), new water softener and plenty of windows throughout the home letting in natural light and amazing 360 degree views. You will love the wonderful open floor plan that has lots of gathering space in the Great Room, Family Room, Mud Room and Loft. Plus, enjoy having a bonus room with incredible views that makes a great workout room or whatever you need. Your cook will be so happy in this beautiful kitchen that has plenty of cabinets and counter space, a large center island, new range & hood and pantry to make meal preparation a breeze. Serve the meals at the snack bar, in the sunny eating area or out on the patio. Escape the world to your luxurious Master Suite and feel like you live in a mountain resort. Love the private Master Bathroom with separate jetted tub and shower, dual sinks, large walk in closet and private balcony. Appreciate having 2 more bedrooms near the Master and 1 on the main floor so you have room for everyone. Also, having another full bathroom and a half bathroom will be a great convenience for loved ones. Relax, dine and entertain on the patio with pergola as you enjoy the privacy of your yard. With almost 2 1/4 acres, you have plenty of room for kids, pets and gatherings. The fire pit will be a favorite hangout for friends and family. You will love the tranquility of the gentle seasonal stream running through the property. You will also appreciate having a 3-car garage and lots of room for parking vehicles including an RV and/or boat. Also, the HOA has 1,600 acres of common ground, including a fishing pond and picnic area, that you can enjoy for hiking and wildlife watching. All this is located close to all the recreational options of the Ogden Valley including world class skiing at Snowbasin and Powder Mountain, water sports on the Pineview Reservoir, golf at Wolf Creek and hiking, biking and horseback riding on the miles of trails. Yet the amenities of the Wasatch front (dining, shopping, entertainment, university, hospitals, etc) are only minutes away. Call today for your private tour.